Chief Miuccio at the WTC site. Retired FDNY Battalion Chief Robert Miuccio, a Ground Zero hero famed for walking through burning buildings with a cigar in his mouth instead of an air mask, died Thursday of 9/11-related cancer, his family said. He was 76. "My dad never stopped thinking about the guys in the department," his son, retired firefighter Robert Miuccio Jr., told the Daily News. "When we were at the hospital, he was talking in his sleep. 'Come on boys! We gotta put the fire out.'" Miuccio, who served with the department for 39 years, died after a two-year battle with lung cancer, officials and family said. When planes crashed into the Twin Towers, the Staten Island firefighter — whose brother Richard, 55, worked on the 86th floor of 2 World Trade Center — grabbed his gear and boarded a ferry headed downtown. Miuccio's brother perished in the terror attack. He set aside his grief for the next 3½ months as he led firefighters' efforts to recover the remains of the dead. hareSigns will be added to the exterior of FDNY ambulances that highlight penalties for assaults against EMS personnel, officials FDNY officials announced. The first ambulances to display the signs are assigned to Station 26 in the Bronx, where EMT Yadira Arroyo was struck and killed in March 2017 while attempting to stop the theft of her ambulance at an emergency scene. Arroyo, a 14-year-veteran of FDNY's EMS bureau, was killed March 16, 2017 when a man jumped in to the driver's seat of her ambulance after she stopped the emergency vehicle. The man struck fatally struck Arroyo and injured a second EMS worker. The man jumped into the ambulance and drove forward, striking an EMS worker. He then put the ambulance into reverse and backed over EMT Yadira Arroyo before speeding around the corner where he crashed into a parked vehicle. Arroyo left five children behind. FDNY firefighter Thomas F. O'Brien, who died in the line of duty in 1935, was finally recognized with a plaque during an ceremony Tuesday. 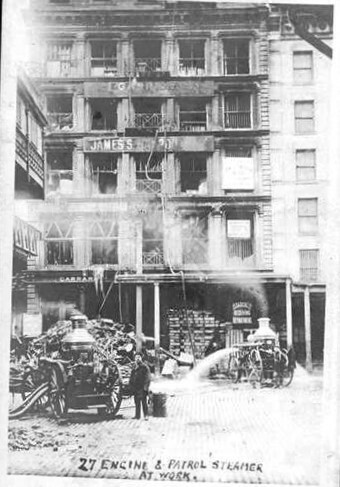 Thomas O’Brien, 48, died on October 28, 1935, hours after he suffered injuries in a fire on West 26th Street in Manhattan, apparently after he was struck on the head by falling debris. An investigation by McCarty, chronicled last year in Newsday, uncovered an autopsy report from 1935 which stated O’Brien died from a fractured skull & brain injuries suffered during the fire. At the ceremony on Tuesday morning, Arthur O’Brien thanked not only McCarty but former city medical examiner Michael Baden, who did a recent analysis of the original autopsy results & Gerard Fitzgerald, president of the Uniformed Firefighters Association for help in talking with FDNY officials. ___ (c)2018 Newsday Visit Newsday at www.newsday.com Distributed by Tribune Content Agency, LLC. If these walls could talk- there are many buildings that have been around since before the paid Fire Department of the City of New York was organized that are still being used today. Then, there are some, no longer firehouses but still hold it's history inside the 4 walls. 1 building in particular at 155 Mercer Street, still shows signs of what it once was, 'Fireman's Hall'. Present day 155 Mercer Street is a clothing store with bright lights, but if you look beyond that, on the front facade, you can still see 'Fireman's Hall' carved into the building, spelling out it's rich history. January 6th, 1854, construction contracts were signed to build a new Fireman's Hall to replace the old building. 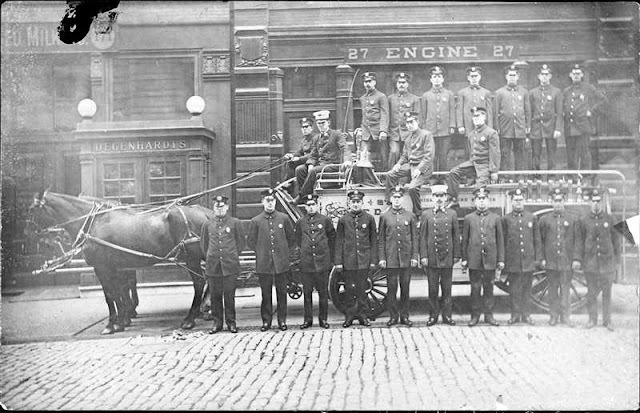 A box was placed into the cornerstone containing the history of the New York Fire Department since 1816, a history of the old Fireman's Hall, a bible, a copy of the US Constitution & a score of other documents including copies of the local newspaper. 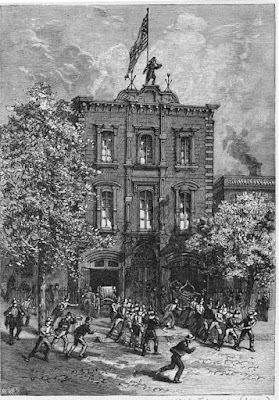 The ground floor would house New York Hose Company 5 & Ladder Company 6 of the Volunteer Department. Each company is to have 15x90ft, which will be divided in 3 rooms. 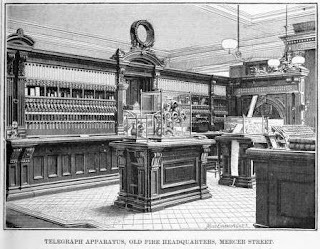 The front room for the apparatus, the centre room for their meetings & the room in the rear for sitting & reading. 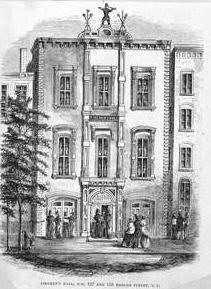 The 2nd floor would contain a large meeting room, 38x71ft for meetings of the representatives, engineers & foremen, & the Exempt Firemen's Association. The 3rd floor held an identical sized room used as a library & reading room & smaller rooms for the librarian & committees. The front of the building is to be Connecticut brownstone, cut in the best manner. The style of arcitecture is Italian, or composition of Greek & Roman details applied by the Italians to modern buildings. Battalion Chief Danny Sheridan of the 3rd battalion out of Hunts Point has been with the FDNY for 32 years. He says after Sept. 11 he provided supplies and equipment to firefighters in less developed countries in South America as a way to give back. His efforts also led him to Ecuador where he educated firefighters about FDNY best practices. “They (other firefighters abroad) were literally running around in shorts and flip-flops with bandanas around their faces. They were just shooting water everywhere, there were hoses everywhere. So I thought to myself, there has got to be a better way," Sheridan says. Fallen FDNY hero Christopher Raguso — killed in a helicopter crash in Iraq during a stint with the Air National Guard — often sought refuge from the haunting memories of his service aboard his boat. Now, the family he left behind can try to do the same. Fresh off a major overhaul — provided free of charge by a fellow volunteer firefighter — Raguso’s Edgewater 185 power boat was presented back to Raguso’s wife, two young daughters, and brother Sunday afternoon on Long Island. He’s seen a lot of death and destruction, and he had that thousand-yard stare a lot,” John Raguso told The Post of his late son. “The smile on his face was ear-to-ear as he took his wife and his two little girls out there and went water-skiing and clamming and catching sea robins, and just exploring. That’s what he loved to do,” he said. January 7th 1997 was a rather mild winter day, temperatures in the 40’s with wind gusts exceeding 30mph. These conditions would challenge firefighting operations in an afternoon fire. Just after 2pm, Engine 40 responded to an EMS run at the Empire Hotel at West 64th Street & Broadway, Box 969. Up the block, a fire broke out in a high rise residential building. 2:31pm, the teleprinter in the Cavemen firehouse of Engine 40/Ladder 35 alerted members of Ladder 35 to a reported High Rise Fire, Box 9999 was used because Box 969 was out already for the EMS run. 20 West 64th Street Broadway – Central Park West. E=Multiple Dwelling: Fire 28th Floor Apt 28K AKA 1 Lincoln Plaza. Ladder 35 hit 10-84 (arrival) at 2:34pm; members could see smoke from the 28th floor of the 44 story high rise multiple dwelling V shaped. Upon entry to the lobby, members were met by a female claiming to be the house keeper of Lionel Hampton. She said the bedroom of the apartment 28K was on fire, the apartment door was closed and handed them the keys. Lt Gormley L-35, and his men proceeded to the elevator bank that serviced the upper floors. A keyed switch was found in the lobby and that recalled the elevators. FF James O’Donnell, L-35 OVM attempted to locate the elevator with the control key but none had it. The members entered the elevator and FF O’Donnell pressed 26th floor, 2 floors below the fire floor as per procedure. When they arrived, the doors opened to a smoke filled hallway. Members of Ladder 35 located the ‘You Are Here’ sign in the hallway then located Apt 26K to have an idea of where the apartment on the fire floor would be and where the stairs were located in relation to the ‘K’ line apartments. Lt Gormley decided the ‘V’ stair was closest to 28K and would be used as the ‘Attack’ stairway. The members proceeded up the stairs to the fire floor. FF O’Donnell stayed with the elevator and attempted to return to the lobby to pick up Engine 23. The elevator wasn’t in Fireman Service, it went up instead of down. FF O’Donnell was placed in a high heat and smoke environment and had to don his SCBA. The elevator brought him to the 43rd floor. At 2:36pm, the 9th Battalion arrived to assume command. FF O’Donnell attempted to transmit from the 43rd floor to Chief Grosso in the lobby but the only person to hear his communications was FF Ed Santore, E-40 ECC, who arrived 3rd due coming from the EMS run. FF Santore relayed to Deputy Chief Dunn of the 3rd Division, the report by FF O’Donnell that conditions on the upper floors were deteriorating. 2,753 Lifes lost in NYC on September 11th 2001. Only 12 of the bodies found intact could be identified by sight. Everyone deals with depression in their own way. As the anniversary of 9/11 quickly approaches, I would like to share my story of dealing with PTSD, and I manage it every anniversary. I only worked at the site for a day on 9/12/01, and what I saw will stay with me forever. I can remember 9/11/02 was a restless day and very depressing. On 9/11/03, I decided not to sit around and cry, so I drove into Brooklyn. I found a park in Brooklyn Heights that had a great view of Lower Manhattan. There were a lot of other New Yorkers there, candles were lit and we just watched our City and the skyline that will never be the same. I had a camera with me, in the early 2000's, digital cameras were up and coming. So I took a few pictures. Little did I know, this was me dealing with my PTSD. I was still depressed but I managed to find something to occupy my night and kind of keep me occupied. 9/11/04, I ended up doing the same thing and to this day, I plan accordingly. Since I became an FDNY Firefighter, I got creative. I spent a lot of money on a good camera. During the day I spend the anniversary with my firehouse family as we remember everyone who was lost from the firehouse that day. At night, I do the same thing I did on 9/11/03. 9/11/13, I reached out to a friend on the Fire Boat and they took me out around Manhattan. 9/11/14 & 9/11/15, I went to New Jersey. While I have plenty of pictures, I will continue the tradition. What took place on that day was nothing but the best of the FDNY and the Country's Fire Service. Members in different capacities gave it their all. Some were working, some weren't. Some were retired, working at the WTC as Fire Safety Directors, others were on injury at Headquarters and still responded. Retired members from home who didn't have to come out, did. An actor/former FDNY Firefighter turned the cameras off and went to his former firehouse to help. On 9/11/01, I responded as a volunteer from Long Island, I met a lot of other members from departments in NY, NJ and across the country. Below are pictures I have taken. There are 3 pictures that I took from 2003 at the park. We lost members right after 9/11 to PTSD suicide. I wish I could turn back the clock and tell them, there is another way, but I understand their pain.... we all do. If anyone struggles, the FDNY CTU is there for you. Don't deal with it alone, because your not.